in ALL caps: What a catch! They're Fall Out Boy. And they're not just for emo kids and screaming girls. They speak loudly to a lot of post-punk thirtysomethings. Non-emo kids, despite being unwilling to admit it, love them too. And we all know it. Pete Wentz called it almost two years ago when he said "There's the bands that you say you like to sound smart, and there's the bands you say you like to get laid. And then there's the bands you really listen to." was he referring to the emotards who won't admit they are at zia to buy their record? ...And that was back when Infinity on High was released. Sure, we could have just bought it on iTunes. But there are still some bands worth a midnight trip to the record store. Music snobs will be aghast that Fall Out Boy is slotted into that category. But give Folie a Deux a listen and it's easy to see just how talented this fourpiece from Chicago is. And how far they've come. When I hear "She's My Winona", (and by the way, before we give emo a bad name, let's take a moment here to give reverence to Johnny Depp) I feel like I am listening to one of my old favorites off Take This To Your Grave or Under The Cork Tree. The "quit burning bridges and drive off of 'em" dark lyrics that get delivered so beautifully by Patrick Stump it allows for both the dry humor and the pain to emanate. Elvis Costello from ELVIS COSTELLO! is what I fell in love with years ago but enhanced. What I thought couldn't get better before, BETTER. In ALL CAPS. And it still takes my breath away after all these years. It surprises me how much better it gets. Sure, the early days were unsure and awkward. It's mildly embarrassing to think back to those days. But as it got good, and built more and more on what was good, and went in bold directions... wait, am I still talking about FOB? If you are looking for something BETTER, don't look for a Kanye West remix. You want a MASHUP. 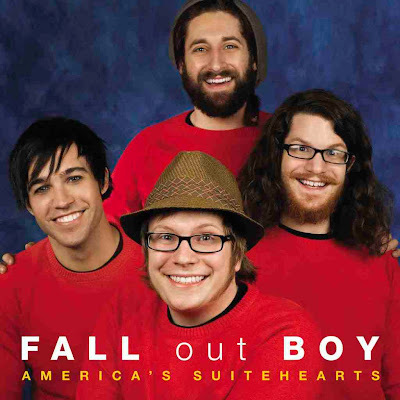 Check out FOB vs White Stripes. And don't make Baby Jesus cry. Go buy some Fall Out Boy.